Turtles large and small, freshwater and terrestrial sometimes need to cross roads—a risky feat for these slow-moving creatures. What compels them to cross roads? They have as many reasons as we have for building roads. Males must search for females. Females must search for places to lay eggs. In times of drought, they must search for water. In fall, they must search for places to hibernate. 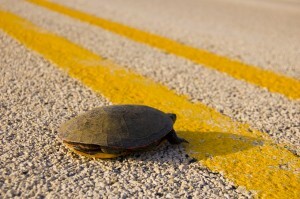 As you drive, be sure to scan the roadway because the dark spot in the road up ahead may be a turtle. As roads crisscross more and more turtle habitats, the risk turtles face from car strikes increases. If you encounter a turtle who is attempting to cross a road, help him to the other side only if you can do so safely. Make sure you place him on the side of the road and in the direction he was headed. If you live in the South or Southwest you might also encounter tortoises trying to cross the road. Tortoises like box turtles do not require bodies of water. Tortoises live in burrows underground and provide habitat for many species. Tortoises cross roadways for all the same reasons as their turtle cousins. Read on for tips that may be useful next time you see a turtle in the road. First and foremost, NEVER pick up a turtle by the tail. You can severely injure the turtle by doing so, because the tail is a part of the spinal cord. However charmed you may be by a turtle you stop to rescue, do not attempt to keep her as a pet. Turtle populations are in decline for many reasons including significant habitat loss. They have a naturally low reproductive rate, and removing any individuals from the wild can greatly impact the local populations. Turtles may also carry salmonella, so keeping a turtle as a pet can create a health risk for you and your family. You also want to resist the temptation to relocate the turtle to a place you think would be safer for him or her. Like most animals, turtles are safest in the habitat they know best. Turtles are bonded to their home turf and will use their exceptional navigational abilities to find their way back home. Relocating them forces them to cross roads and navigate other hazards as they attempt to return to their home range, repeatedly putting them in harm’s way. Avoid placing turtles on rocky places or steep-sided ditches; instead opt for flat areas of grass or dirt making sure to always face them in the same direction they were going. Tortoises and box turtles are not water turtles and should never be put into a stream, pond or lake. 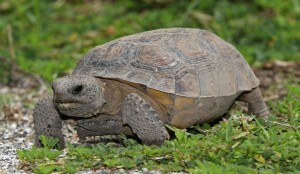 Tortoises, like this gopher tortoise, and box turtles are terrestrial and should never be put in water when rescued from the road. If you see a turtle while driving, pull over safely, and put on your hazard lights. Before entering the roadway to help the turtle, carefully assess what other drivers are doing. If someone appears to be planning to stop to allow you to help, be certain you’ve made eye contact and indicated your intentions to go into the road. If the turtle is on her back, carefully flip her over. If the turtle is injured, transport her to a wildlife rehabilitator. If the turtle is okay, move him to the side of the road he was trying to reach. Do not put the turtle in water. Not all turtles are aquatic and can easily drown. Hold a small turtle by both sides of the shell behind the front legs. Hold a larger, heavy turtle that has a long tail by the two back edges of the shell, as he may be a snapping turtle. Push or drag him to the intended side of the road. If you turned the turtle to drag him, turn him back in the right direction before you leave. If you have a floor mat or towel handy, it will make pushing or dragging easier—if not, don’t worry. A turtle’s strong skin can handle some mild scrapes. If lifting a turtle to move him, keep him low to the ground, so if you lose your grip, the impact of the fall will be minimal. Wash your hands thoroughly as soon as possible after handling a turtle. If you live in Florida, download the Fish and Wildlife Commission Gopher Tortoise app for smart phones and document the tortoise and/or burrow. BE A CITIZEN SCIENTIST!! 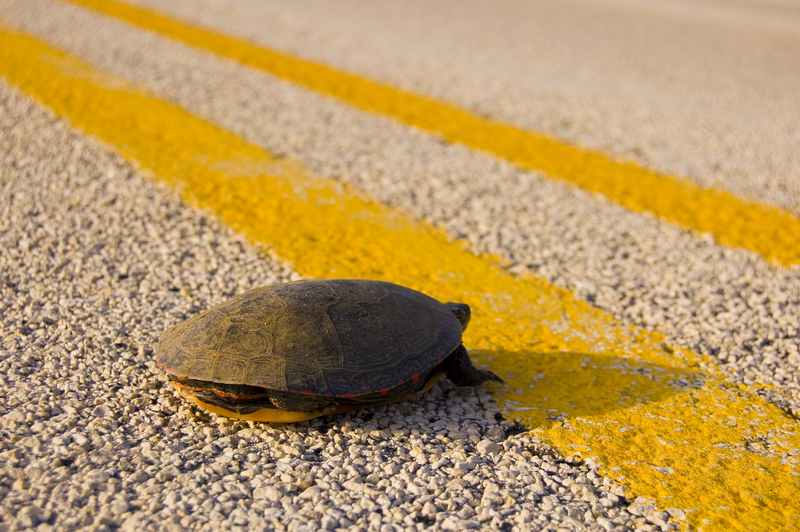 Watch carefully for wildlife when driving—especially for slow-moving turtles!